SAN PEDRO TOWN, Thurs. Feb. 25, 2016–Police are investigating the vicious death of San Pedro resident, Frank Edwards, 27 of the San Mateo area of San Pedro, who was found dead at his home with multiple gunshot wounds to his chest, stomach, neck and face. Assistant Superintendent Henry Jemott, Deputy Commander of San Pedro Police, said that various calibers of weapons were used in the shooting – .45, 9mm, and also a 12-gauge shotgun. Recovered from the scene were seventeen .45 auto expended shells; fourteen .9mm expended shells; two 12-gauge expended cartridges; one 12-gauge live cartridge; three .45 slugs; two .9mm slugs; and five pellets. The bullet-riddled body was taken to the Karl Heusner Memorial Hospital Morgue, where it awaits the mandatory post-mortem examination to certify the cause of his death. The murder occurred at about 7:30 Tuesday night at Frank Edwards’ home. Reports to Amandala are that he was at home with his family when there was a knock on the door, and the persons from outside shouted, “Police, open the door.” When he went to open the door, however, gunmen opened fire on him. When Edwards fell to the floor in the hall, the killers continued to shoot him, after which they ran out of the house and escaped in a boat that was waiting for them. When police came they put Edwards in a boat and took him to the San Pedro Poly Clinic, where he was declared dead on arrival. Assistant Superintendent Henry Jemott said that police had had no dealings with Frank Edwards for almost a year, but that he had a violent past which, the senior police officer believed, caught up with Edwards. He strongly believes that Edwards was killed in retaliation for a past murder on the island. Edwards was the main suspect, but was released due to insufficient evidence. 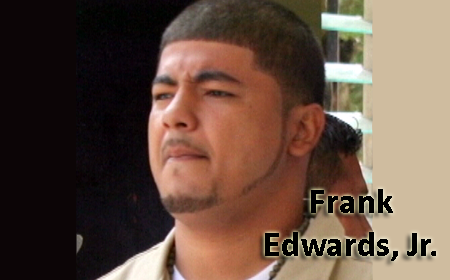 Police said that Frank Edwards was arrested and charged for many crimes, some of which are: in 2009, Edwards and three other men were charged with the double murders of James Swan and Edwardo Gutierrez. In May of 2012, they were found not guilty and were released. In November 2013, Edwards engaged the Belize Coast Guard in a shootout. He suffered a gunshot to the hip and buttocks in the shootout, but recovered. Edwards was also arrested and charged for the murder of a security guard that occurred during a Scotia Bank robbery in 2010, in which over $300,000 was stolen in Spanish Lookout. He and two other men escaped to Guatemala after the robbery and the murder, but the Guatemala police shot and killed two his companions and arrested him and handed him over to Belize police. Edwards was charged with the murder of the security guard. In that case, however, Edwards told the judge that he had been beaten by police, and the case was thrown out. Frank Edwards is survived by his baby, 1 week old, and his wife. He is also survived by his father and other family members.